Urbanspoon suggested the Buttermilk Drop Bakery and Cafe, so off we went. It wasn't quite what we expected from a "bakery and cafe"; it was just a case of pastries and a steam table of breakfast items, with two small booths in a dimly-lit corner. So the signmaker can use a comma, but chose not to use one between "gumbo" and "potato salad", which raises the possibility that they might offer some dish I've never heard of called "gumbo potato salad". Unfortunately, the staff seemed busy enough that I didn't ask the question. 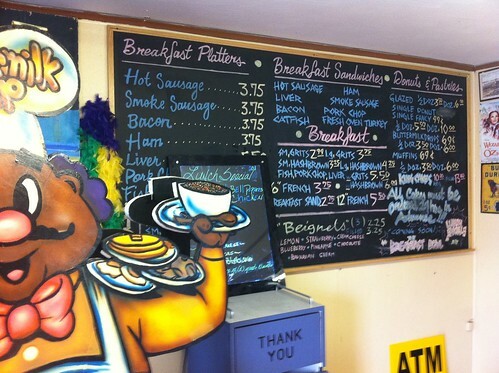 And my picture of the menu board obscures the lunch specials, so that provides no clues. We were very interested in the flavored beignets, but they were out. After a few more tries off the menu board, it became clear that they were out of most things, so we went with what we could see on the steam table. 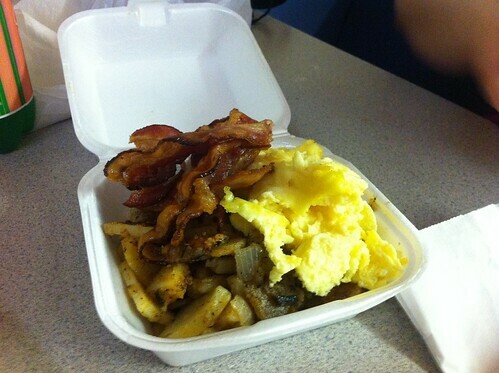 Lori ordered bacon, eggs, and hash browns. The bacon and eggs were good but uncompelling. The hash browns were too spicy for Lori, but I quite enjoyed them; they were soft and zesty, some of the best hash browns I've had from a lingering stay on a steam table. 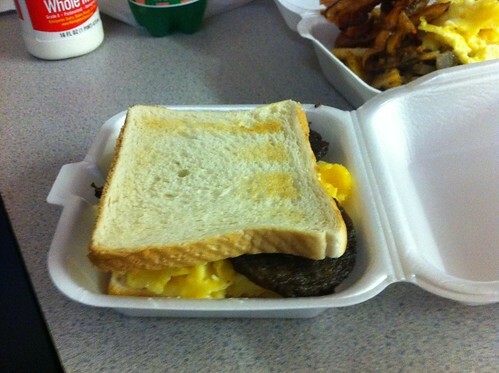 I ordered the smoked sausage sandwich, which turned out to be tough, dark patties of breakfast sausage with egg and cheese on barely toasted bread. It was actually pretty good, but I think that was mostly in spite of the sausage, not because of it. Because we were at the Buttermilk Drop Bakery, we ordered buttermilk drops. 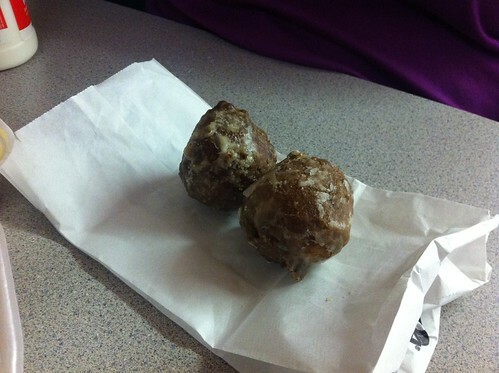 They were large cake donut holes, crusty on the outside and tender on the inside, with a rich flavor and mild sweetness. 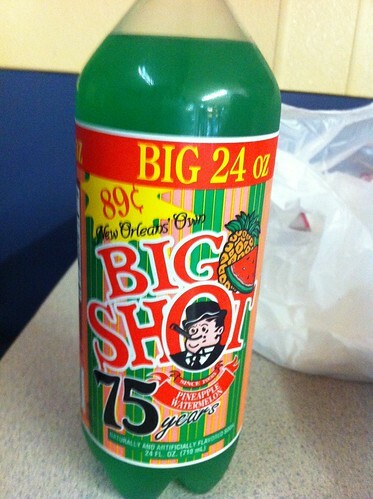 There was a beverage cooler well behind the counter, and I saw that they contained a soda called "Big Shot". I'd never heard of Big Shot, so I decided to order one. But I couldn't see the flavors clearly. So I ordered "green", figuring it would be something novel. I invite those of you who are not familiar with Big Shot to make a guess of what flavor you expect a green soda to be before you look at the picture. If you guessed that a green soda would be "pineapple watermelon", you're a much better guesser than I am. When I tasted it, I thought it was pretty good; the watermelon cut the sweetness of the pineapple to make something that was pretty drinkable and refreshing. But when Lori tasted it, she said that it tasted "like liquid SweeTarts", and after that, it tasted like that to me too. Buttermilk Drop Bakery is definitely a very local place (supporting evidence: we were the only white folks in there the whole time of our visit), and our meal was pretty good. 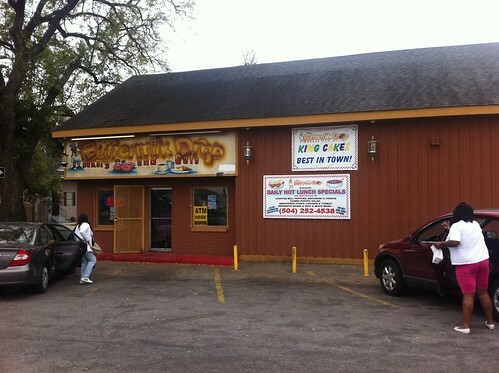 I would give it another try, but I'm not ready to nominate it as a Roadfood place yet.